Hotel Villa Gulle is a cozy, atmospheric older - but newly renovated hotel with a beautiful view of Nyborg Harbour. We have build our compagny on a careful, personal service. To soft music and Subdued lighting - you can enjoy our good but simple Danish menus - in the cozy old dining rooms with harbor views. 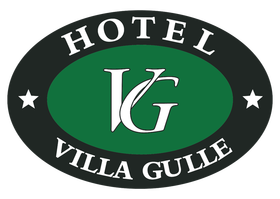 Hotel Villa Gulle is centrally locatated in the center of Nyborg, yet close to the station, highway, forest and beach. On the whole, I Gulle Simonsen, is a very fortunate woman, the happy owner of such a beautiful house with aglorious location and with so many, many wonderful guests as I receive at Hotel Villa Gulle.